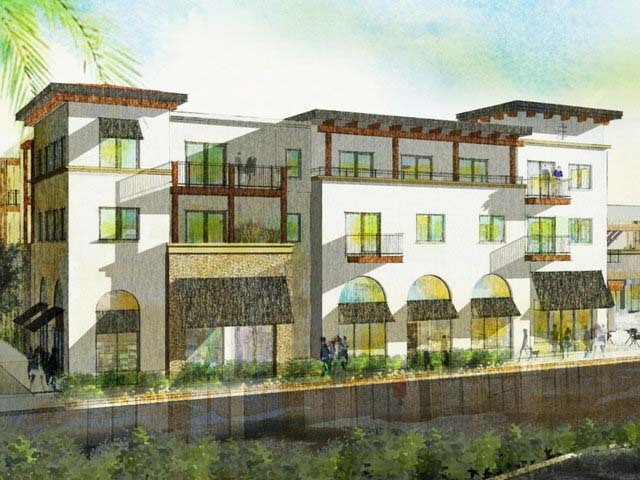 Canadian real estate developer Capexco broke ground Monday on a $35 million mixed-use development in downtown Poway. The new development, named Outpost, is on a 1.58-acre parcel of land and is expected to include 53 residential units, an urban food hall and a 20,000-square-foot fitness center by Crunch Fitness. Outpost is the first development under the updated Poway Road Specific Plan, which the Poway City Council approved in December 2017. Poway Mayor Steve Vaus and the City Council approved the Outpost project in March; it is expected to be completed by fall 2019. Trent Claughton, president and CEO of Calgary-based Capexco, said Outpost is named as such because he sees Poway as a destination for all of San Diego County. Outpost will comprise three buildings that will house the project’s amenities, a pedestrian paseo between buildings, outdoor seeing, a patio above the food hall and underground parking. The Pomerado News reported that Marco DeDominicis of a Poway is a Capexco partner. DeDominicis said it should take up to 2½ months to dig the two levels for underground parking.